When hikers found an injured dog on the side of a mountain, one determined woman slung the 50-pound animal around her neck in hopes of reuniting him with his family. Tia Vargas found the pup when she was hiking through the Grand Tetons in Wyoming on an annual trek with her father last month. Tia wanted to travel all the way up to the 11,000-foot peak, while her father decided to wait on the trail as she soldiered on ahead. One mile up, she found a concerned family standing next to an injured English springer spaniel. The dog was limping, but the owners were nowhere to be found in the surrounding area. 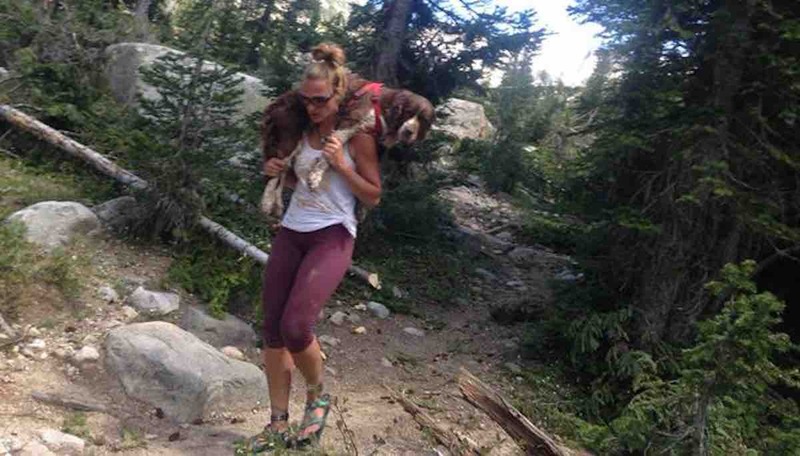 Tia then took it upon herself to literally shoulder the burden and carry the dog named Boomer back down the mountain. When she rejoined with her father and continued heading down, the journey became excruciating. Occasional rain and snow made it difficult for them to find their way back, and they got lost twice in the inclement weather. Finally, with the help of her father’s constant humor and encouragement, Tia and Boomer made it down the 6-mile trail. Once they reached the bottom, they saw a “Lost Dog” flyer with a family’s phone number. Boomer’s owners were overjoyed to be reunited with the pup. They explained that when they had been at the top of the mountain the day before, he had fallen off a 100-foot cliff and rolled 200 more feet down the mountain. The family rushed to find him, but he was nowhere to be found. Coincidentally, Boomer’s owners told Vargas that they were moving to Arizona – and though they loved the dog very much, they were not allowed to take him with them and he was in need of a new adopted family. Though they had prospective caretakers lined up, it was clear that Tia and Boomer had a special bond. Without hesitation, she adopted him. The spaniel was taken to the vet and diagnosed with a torn ligament and a dislocated joint, but his leg is now healing in a little doggy cast. Despite the fact that it took his injury to bring them together, Vargas says that the incident could not have been more fortuitous.